The Fukushima disaster taught us a lot about the dangers, and possibilities, of technology. The nuclear power plants, damaged from the earthquakes, became danger zones that required the use of robots to go where no humans should ever dare to go — right into a potential hellmouth of radiation. That was over a year ago, and local residents are still (understandably) worried about the possibility of continued radiation exposure. 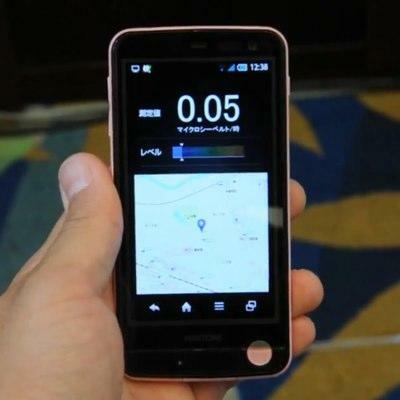 Recognizing this, Softbank has put out a new category of mobile product — the smartphone-slash-radiation-meter. Known for being the first to bring the iPhone to Japan, the company has now released the Pantone 5 (model 107sh), a new device that features a simple and very intuitive one-touch interface: The user simply presses the soft button on the front to get the radiation reading for their location. It's not quite a radiation detector — that would be prohibitively expensive — but it does give people access to pertinent data quickly and easily. And if that can ease minds, then it's a good thing. Radiation is still a touchy subject in Japan — so much so that the company doesn't appear to be promoting the feature very heavily. And so it tiptoes around the subject, all while trying to generate some buzz around the phone's release in July.